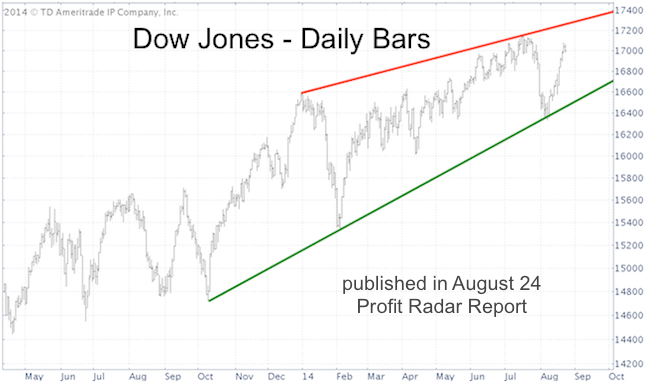 On Friday the Dow Jones hit the ideal target of a rising wedge formation. The rising wedge is a bearish formation that projects about a 10% decline for the Dow if the lower wedge line (see Dow Jones chart) is broken. This red line has been our up side target ever since. On Friday the Dow reached its target and pulled back as quickly as a hand accidentally touching a hot stove. What makes a wedge a wedge? Although prices rise within the rising wedge formation, market breadth is gradually petering out, as the advance is progressively growing weaker. That’s what we saw on Friday. Even though the Dow ended 0.08% higher, 60% of stocks traded on the NYSE declined. 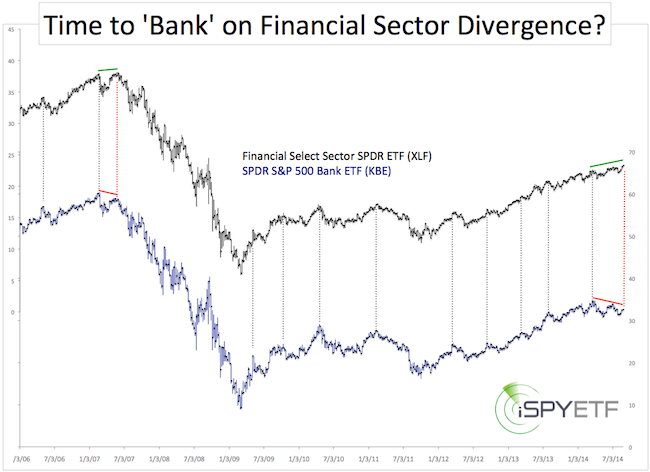 This rare breadth/price divergence occurred only 7 other times since this QE bull market started in 2009. What are the implications of a wedge breakdown? 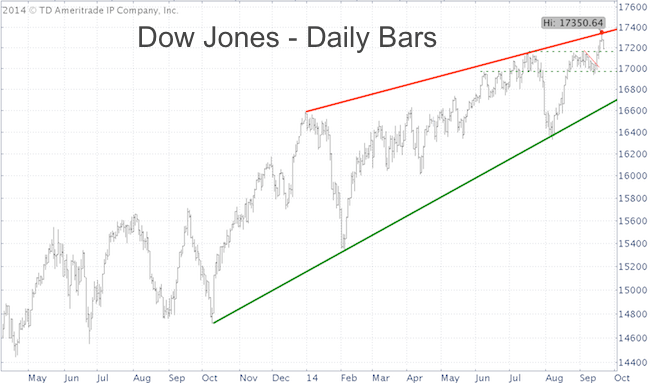 The Dow already touched the upper wedge side (red line). Once prices break out of the wedge down side (solid green line) they usually waste little time before declining and retracing all of the ground gained within the wedge itself. So, a drop below the solid green line (currently around Dow 16, 700) could unlock a target around Dow 15,000. But let’s don’t get ahead of ourselves. The stock market has steamrolled over many bearish setups before and may do so again. The pattern could also get more complicated as was the case with the LQD Corporate Bond ETF earlier in April. If you want to take baby steps, trade below 17,160 and 16,900 (dashed green support areas) would be initial confirmation of further down side. New Trend? Dump AAPL to Buy MSFT? For most of the 21st century Apple has been cool, while Microsoft couldn’t do more than drool. But things are changing (at least for investors). Microsoft has gone from ‘drool to cool’ on Wall Street. Will this surprising trend last? Apple is hip and cool. Microsoft is boring and outdated. Apple (Nasdaq: AAPL) is in, Microsoft (Nasdaq: MSFT) is out. That’s been the case most of the 21st century, but there’s been an odd shift lately. 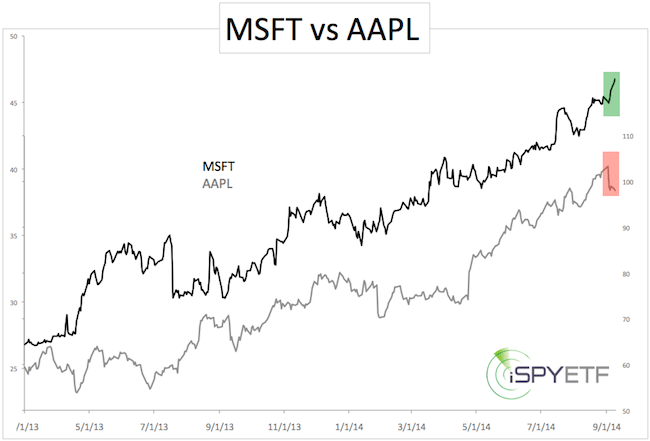 Investors are picking MSFT over AAPL. If Microsoft’s Cortana had a voice in this article, she’d point out that investors are dumping Siri to be with Cortana. The charts below show that Cortana may be right. The MSFT:AAPL ratio chart shows the ratio bounce off a 1-year support level. If the ratio can overcome near-term resistance it is likely to climb further. 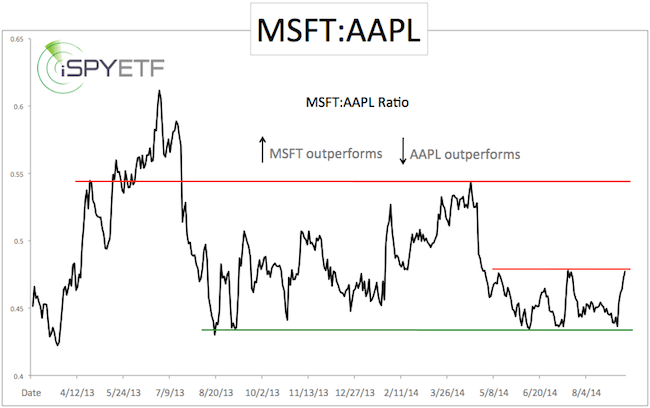 This would suggest MSFT will continue to outperform AAPL, at least for a little while. A look at history, in particular recent history shows that September is a particularly painful month for AAPL investors. Click here to view a detailed look at AAPL seasonality. AAPL and MSFT are the two biggest components of the PowerShares QQQ ETF (Nasdaq: QQQ), which sits right above important support (QQQ support level shown here). Market Pulse: Is Investor Sentiment Really ‘Dangerously Bullish’? 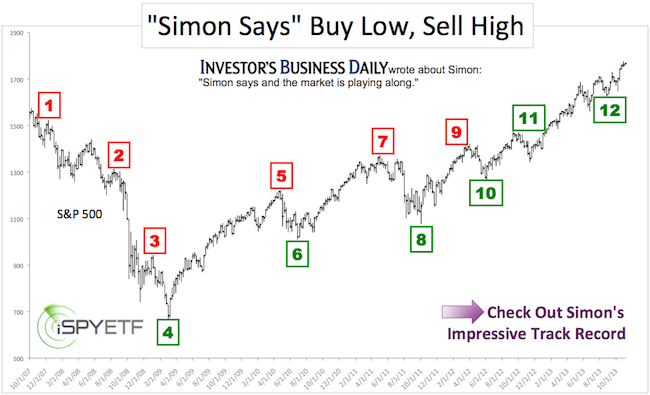 How bullish are investors really? There are different types of investors, individual investors, institutional investors, traders, smart money, dumb money … and there’s a gauge for each group. Here’s a look at six different investor sentiment indicators. The market has been stuck in yet another waiting pattern, so we might as well use the time to look at the forces that may (or may not) jolt stocks out of their waiting loop. According to many, overheated investor sentiment will break the stale mate and send stocks spiraling lower. There’s just one flaw with this line of reasoning. Sentiment is not overheated. The Profit Radar Report continuously analyzes how investors feel about stocks and publishes a comprehensive sentiment picture once a month. Where are the sentiment extremes? There’s only one: Last week 51.92% of individual investors were bullish. That’s the highest reading since December 24, 2013. The red lines highlight other 50%+ spikes and how the S&P 500 reacted. Yes, the bullish December AAII reading was followed by a January pullback, but there’s a big difference between today and December: No other indicator is confirming August’s AAII spout of enthusiasm, and AAII bulls are back down to 44.70%. There was one more extreme not illustrated by the chart: The percentage of bearish investment advisors polled by II dropped to 13.3%, the lowest reading since 1987. This is a legitimate extreme. 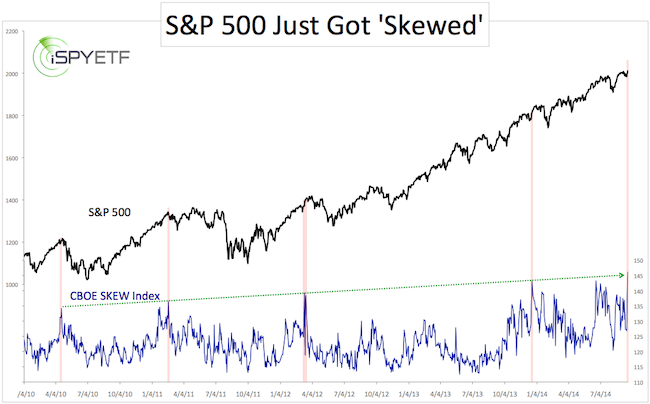 “Perhaps most noteworthy is that we continue to see isolated sentiment extremes, but the source of such extremes only rotates (the SKEW and put/call ratio in July, the AAII poll in August), it doesn’t compound. We see different gauges hit overheated levels at different times, but never all at the same time. The overall sentiment picture is fractured, and void of the ‘all in’ mentality seen near major market tops. Isolated extremes cause only small pullbacks here or there. 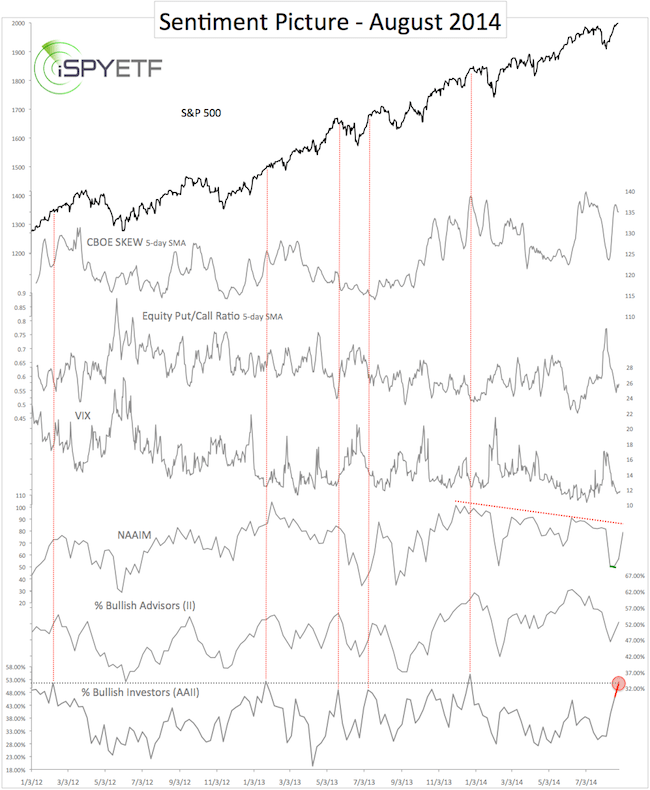 Bottom line, sentiment is not extreme enough for a big scale market top. The most important market breadth indicator, which correctly foreshadowed the 1987, 2000 and 2007 crashes, also doesn’t show the deterioration needed for another crash. A bigger and better iPhone, the new iWatch and new AAPL all-time highs … Apple has a lot of good things going. But, ironically this exciting time of the year (in terms of product launches) is the most treacherous for Apple shareholders. 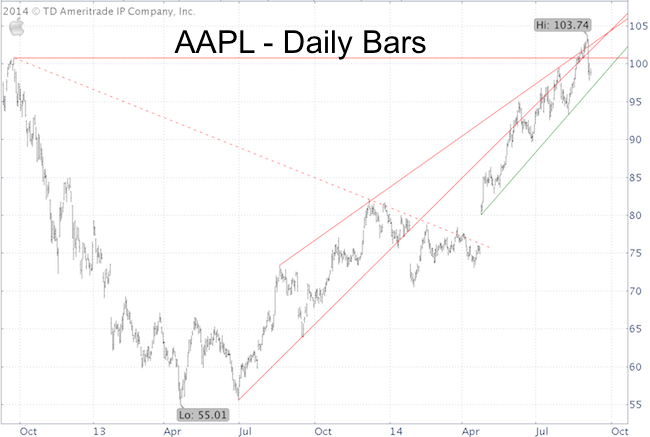 Autumn is an exciting time for Apple geeks, but a treacherous time for Apple (Nasdaq: AAPL) shareholders. Product rumors are planted in the spring and ripen in the fall as rumors mature towards tangible reality. Apple fans are hoping to feel, touch and buy a big screen iPhone or even an iWatch. Ironically the autumn excitement doesn’t spill over to AAPL shares. September 21, 2012 was the kickoff for a 45% correction and August 19, 2013 saw a 12% pullback. A detailed full-year AAPL seasonality chart is available here. The chart below shows the various trend lines and support/resistance levels mentioned. AAPL sliced below 100 on Thursday. Support around 100 has now become resistance. Green trend line support is at 97. Based on seasonality, risk is rising and the path of least resistance is down as long as trade remains below 100 – 101. 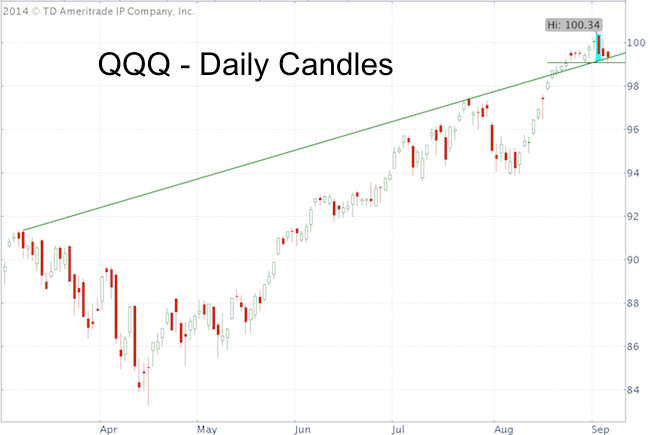 Apple’s ‘bad Thursday’ spilled over to the Nasdaq-100 as the PowerShares QQQ ETF (Nasdaq: QQQ) painted a big red candle. Thus far, QQQ remains above support at 99. A close below 99 may elicit more selling.